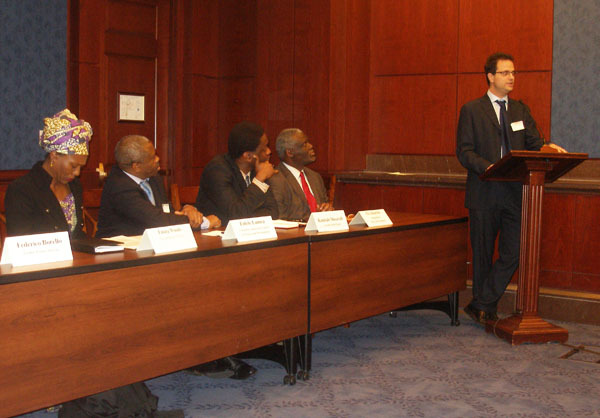 While Congo sifts through the ballots from the presidential and parliamentary elections, a group of Washington, D.C., based policy and advocacy groups focused on human rights in the Congo gathered Tuesday with partners and policy makers on Capitol Hill to discuss the recent elections and its implications in the ongoing battle against impunity for war criminals in Congo. Formulate a series of options aimed at assisting the Congolese government in identifying appropriate transitional justice mechanisms to deal with the legacy of these violations, in terms of truth, justice, reparation, and reform, taking into account ongoing efforts by the Congolese authorities and the support of the international community. The report charges that forces from Burundi, Uganda, and Rwanda were all involved in mass killings in the jungles of eastern Congo in the years following the Rwandan genocide. It contains horrific accounts of human rights abuses carried out by local and foreign combatants, including mass murders of men shot in the back, and women and girls being raped and then cut up. The report also provides recommendations for the investigation and prosecution of these crimes, including the establishment of a special Congolese and international mixed court to prosecute these crimes when they fall outside the mandate of the International Criminal Court. Emira Woods from the Institute for Policy Studies moderated the Hill briefing organized by the Africa Faith and Justice Network and Friends of the Congo. The event provided a forum for a panel of experts to express their concern for the people of Congo who have long had little to no recourse for responding to abuses committed against them. The event came at a critical and fragile moment in Congolese history when the need for justice to be carried out is acute. The panel featured a variety of voices and perspectives: Federico Borello from the U.N. Mapping Team in Congo, Nii Akuetteh, founder of the Democracy and Conflict Research Institute, Ntama Bahati of Africa Faith and Justice Network, Clause Gatebuke from African Great Lakes Action Network, Fidele Lumea of Congolese American Council for Peace and Development, Kambale Musavuli of Friends of Congo, and Professor Ngwarsungu Chiwengo of Creighton University. Each presenter testified about the situation in Congo based on first-hand experiences, calling on the need for justice for victims of the ongoing conflict and reconciliation for communities. As our Congo researcher Fidel Bafilemba explained in a post yesterday about transitional justice advocacy efforts on the ground in the East, around 250 local and international organizations reacted to the U.N. Mapping Exercise Report in 2010 by calling for a transitional justice system to prosecute international crimes not falling under ICC jurisdiction. Discussions between human rights advocates and the Congolese government led to a bill to establish a Specialized Mixed Court to prosecute international crimes committed on Congolese soil from 1990 to present. But the promising proposal, which gives these mixed courts primary jurisdiction over war crimes cases, including genocide, crimes against humanity, and economic war crimes, still faces some significant hurdles. The Specialized Mixed Courts law, having been rejected by the Congolese Senate in August, is now being debated in the Parliament in Kinshasa.